Garden clean-out continues as I figure out what to do with parsley basil, green tomatoes and zucchini. 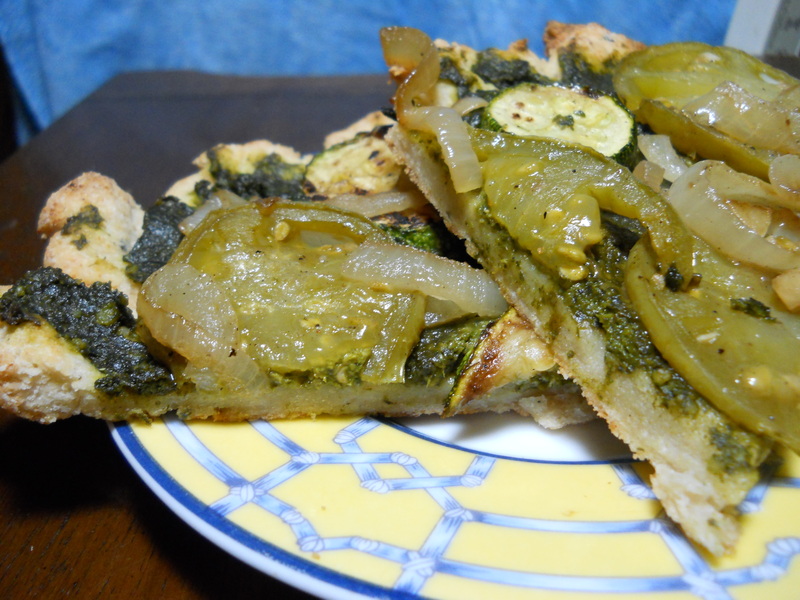 Try this easy pesto pizza! 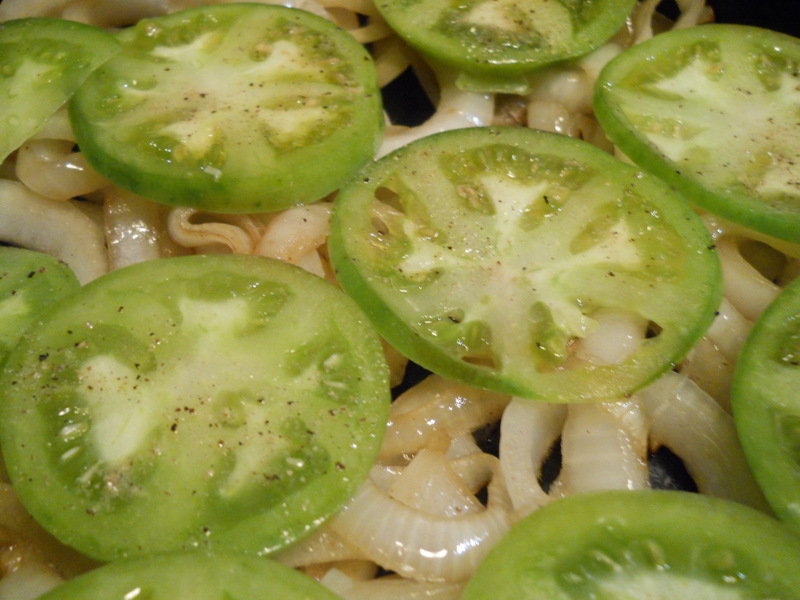 Sautee the onions and garlic in a small amount of olive oil, when they are almost done add in the green tomatoes and cook until soft. Fry the zucchini until browned lightly. 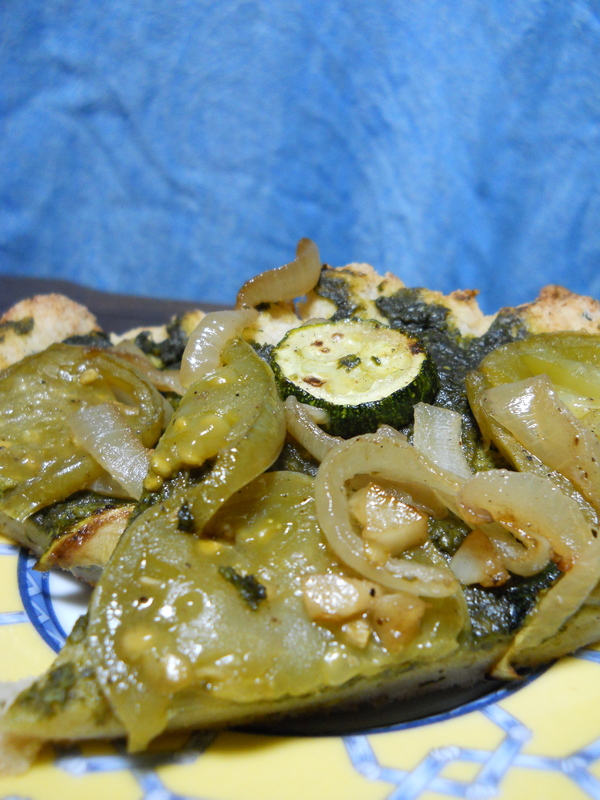 Cook the pizza crust for 10 minutes, then take out and top with pesto, onions, green tomatoes, and zucchini. Cook a second time (this time on a pizza stone) for 10 more minutes. Serve fresh or the next day cold, because who doesn’t love waking up to cold pizza? I love love love this recipe. It says it serves 8, I would say 4… but what does that say about me? 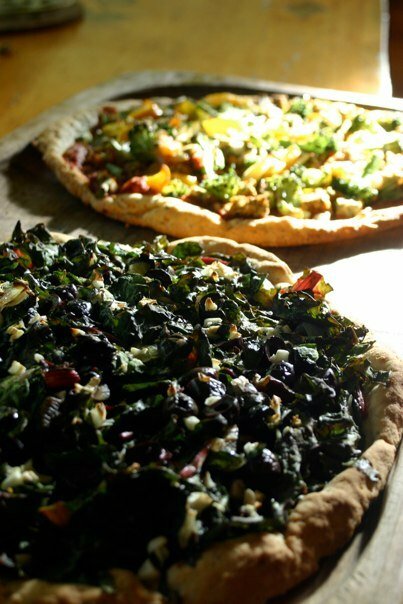 This pizza recipe came from Colleen Patrick-Goudreau at The Compassionate Cook. It has now become a go-to in my pizza recipes and I love the combination feeling of eating a salad-like pizza. When I made it I didn’t use olives or capers, but I will list them since it’s what the original recipe called for. carmalize the onions by sautéing them in oil with salt and 1 tablespoon of sugar. Cook until brown, about 20min. In a bowl toss chard, carmalized onions, olives + capers (if used). Sprinkle salt, balsamic vinegar, and a squeeze of lemon. Sprinkle over pizza dough (after pre-cooking the dough). 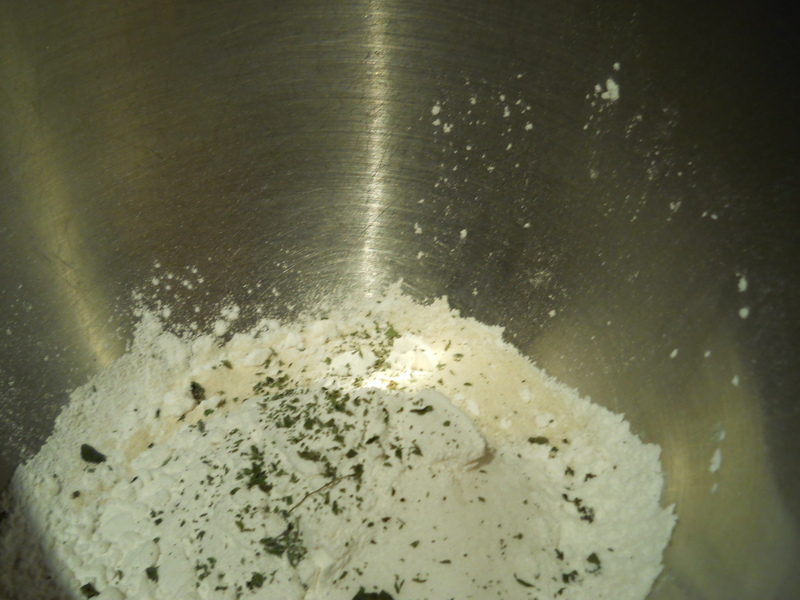 Sprinkle garlic (if used) over dough as well. Cook in oven until done (about 30min). Pictured is a variation with no pizza sauce and white sweet potatoes on top, so tasty. veggies: peppers (green, orange, yellow, and red), onions, broccoli, asparagus, and any other veggies you have available. Make pizza crust. Top with pasta sauce and veggies. Bake in oven. Serve with nutritional yeast sprinkled on top. Drizzle olive oil over unbaked pizza crust. cover crust with tomatoes fairly close together. Sprinkle entire crust with fresh basil leaves. Add garlic if desired.